Almost two full years after he set the oldest-ever hour record of 24.251 kilometres in Aigle, the 102 year old Frenchman Robert Marchand has smashed that mark today. The veteran rider, who has staggered experts due to his fitness level and active lifestyle, covered 26.927 kilometres at the new French velodrome in Saint-Quentin-en-Yvelines, Paris. In going two and a half kilometres faster than his previous record, Marchand may well have set an age record which will never been beaten. Marchand’s original record was set on February 17th 2012 at the World Cycling Centre in Aigle. On September 28th 2013 he went to the Parc de la Tête d’Or Velodrome in Lyon and rode 300 laps, totalling 100 kilometres. He covered that distance in four hours 17 minutes 27 seconds, again setting a new standard. Marchand’s latest effort was done in conjunction with INSERM [Institut National de la Santé et de la Recherche Médicale, or National Institute of Health and Medical Research – ed.] professor Véronique Billat, who announced the bid in November. She tested him in the run up to today’s effort and, based on the lab examinations done, said that she was confident he would beat his previous mark. “According to the calculations made in the lab on Monday, he has 26 km in the legs but he has to adopt to the track bike here,” she told France Cycliste. Those tests showed a maximum heart-rate of 157 beats per minute plus VO2 max of 38 ml/min/kg. Marchand turned 102 last November and is mentally and physically sharp. He trains regularly, lives alone, is self-sufficient and continues to drive. He is just five feet tall (1m52), but is in superb health. Born in 1911, Marchand started cycling at 14 years of age, then later left France and lived in Canada and Venezuela. He worked as a fireman, market gardener, show salesman and wine dealer, and competed as an amateur boxer. 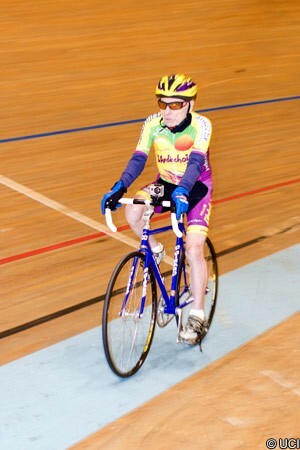 He returned to cycling in 1978 at 67 years of age, building up the distances and training with riders who were far younger than he was. He finally retired from work at 89 years of age and around that time rode the Bordeaux-Paris event. He covered the 600 kilometres in 36 hours. More recently, he’s limited the distance, although he still does a considerable amount. Today’s stunning exploit shows how effective that philosophy has been. Marchand’s feat will be both celebrated and studied, with scientists seeing him as something unique. Many others do as well, not least the crowd who cheered him on today.